Like Romanticism, Realism was a broad cultural movement in the 19th century that had its origin in literature and philosophy. 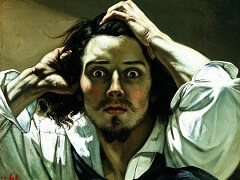 In painting, its most prominent representative was Gustave Courbet. 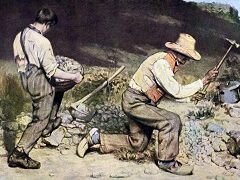 His Stonebreakers represented workers, as he had seen them, in monumental form.The Stone Breakers, painted in 1849, depicts two ordinary peasant workers. Courbet painted without any apparent sentiment; instead, he let the image of the two men, one too young for hard labor and the other too old, express the feelings of hardship and exhaustion that he was trying to portray. Courbet shows sympathy for the workers and disgust for the upper class by painting these men with a dignity all their own. 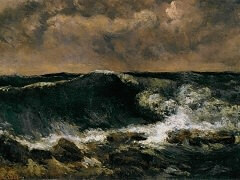 The Stonebreakers, destroyed during the bombing of Dresden in 1945, was the first of Courbet's great works. The Socialist philosopher Proudhon described it as an icon of the peasant world. 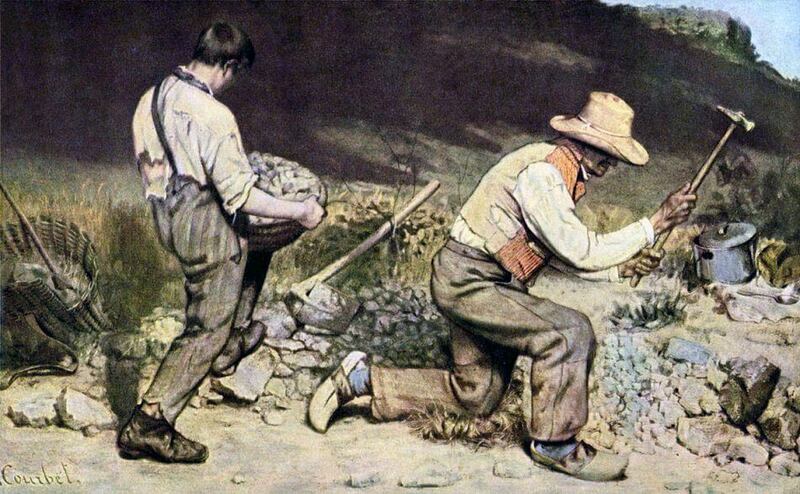 But for Courbet it was simply a memory of something he had seen: two men breaking stones beside the road. He told his friends the art critic Francis Wey and Champfleury: "It is not often that one encounters so complete an expression of poverty and so, right then and there I got the idea for a painting. I told them to come to my studio the next morning." Many of Courbet's paintings focus on everyday people and places in daily French life. 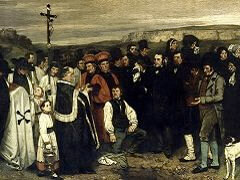 Courbet painted these ordinary people in an attempt to portray the French people as a political entity. 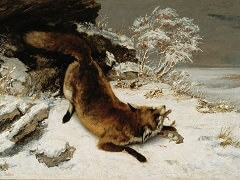 In this way Courbet's republicanism showed through in his work. 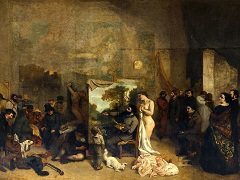 Courbet truthfully portrayed ordinary people and places, leaving out the glamour that most French painters at that time added to their works. 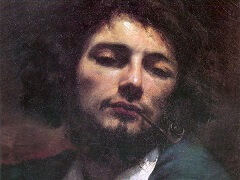 Because of this, Courbet became known as the leader of the Realist movement.